The Wenjiang district of Chengdu, Sichuan province is an important constituent part of Chengdu. It is 16 kilometers to the west of the city's central urban area and 18 km from Shuangliu International Airport. It has a population of 326,700 and contains six towns and four districts, on a 227-sq-km area. Wenjiang is the site of the Yufu kingdom of ancient Shu, and has been a political, economic, and cultural center for western Sichuan since the year 555. It lies on the Minjiang River Plain, which gives it a humid climate and four distinct seasons, with its original ecology and favorable environment. The district is known as Golden Wenjiang for its historical sites, such as the Yufu King's Tomb, Confucian Temple, Chen's Mast, and Mahayana court. The people of the district are thought to be brave and intelligent and helped it develop quickly to become the province's prosperous county, and western China's first International Garden City and a national ecology zone. 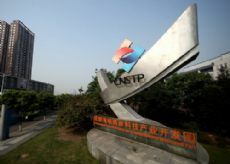 The district contains the Chengdu National Cross-Straits Science and Technology Park, southwest China's largest national economic development zone, with bio-pharmaceutical, healthy food, and electronic information industries. Wenjiang also has a modern service industry which is part of a national reform project and it is also a provincial health service industrial center. It boosts an integration of city and countryside for an international satellite town that is well-suited to business, living and tourism.